Aline's Fashion is fond of the muff and its "old fashion" and romantic style. We try to bring this accessory up to date by designing original models. 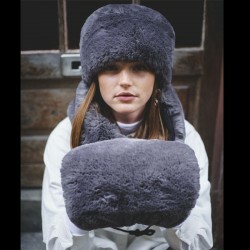 The muff is a perfect accessory for keeping your hands warm when it's cold. Aline's Fashion's muffs are handmade with an outstanding faux fur. Beautiful "wolf" cuff in high quality faux fur! Beautiful fake fur cuff very soft! Nice gray fake fur cuff of high quality! Gray striped faux fur cuff of high quality. Brown faux fur with a fox effect muff. Zip up muff in imitation leather and faux fur. Cold brown faux fur muff. White faux fur with a rabbit effect muff.